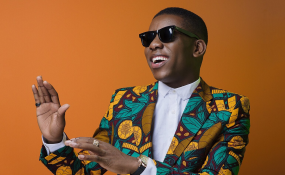 We reported on Tuesday that Small Doctor and three members of his band were arrested but the Omo Better singer has now been released by the chief magistrate, Abimbola Komolafe, of an Ebute-Metta Magistrate's Court, Lagos with an admonition to be of good behaviour. The magistrate gave the advice while she was delivering a ruling in a motion exparte brought before the court by the police from the State Criminal Intelligence and Investigation Department (SCIID), Panti-Yaba, Lagos, seeking a binding order against the musician and others. During the hearing of the case Wednesday, Small Doctor was represented by Mr Yakubu Eleto, Akeem Shittu and other lawyers. After listening to the submission of the police lawyer, Magistrate Komolafe released Small Doctor and other respondents to two sureties with N5 million bonds each. She also made an order that for a period of one year, they must not engage, recruit, instigate or incite any member of the Shogunle community and Lagos State by extension, to cause a breach of public peace or disturb peace within or outside the community and Lagos State.